Uglyworld #767 - This Is Obsidians Rocks, originally uploaded by www.bazpics.com. After making our way back down Paulina Peak Turtle's daytrip plan directed us over to the Obsidian flow, which Babo had somehow not noticed from up above. "Obsidians, reallies?" he asked as we came to a stop in the nearby carpark, "I hasn't seens anythings obsidians since I leaved Uglyworld". Turtle nodded his head and explained that the very reason for him adding this stop to the trip was for Babo to pay the massive flow a visit. As we walked through the trail that wound it's way through the massive collection of volcanic rocks Babo would stop and explain to everyone else what variant they were, in this case he explained Obsidian Rocks. 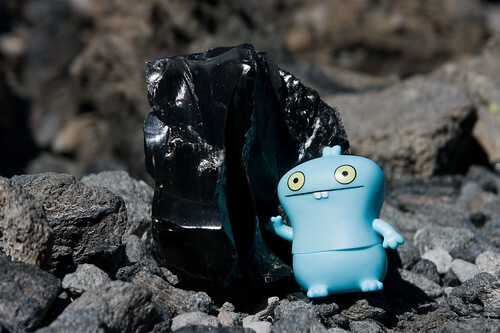 "Because lavas cool and crystallizes rapidlys, it is fine graineds. If the coolings has been so rapids as to prevents the formations of even smalls crystals after extrusion happens, the resulting rocks may be's mostly glass (such as the rocks known as obsidians). If the coolings of the lavas happeneds more slowlies, the rocks would be's more coarse-graineds."